TWO EXCEL® CLASSES. ONE LOW PRICE. 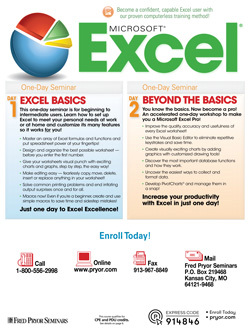 Save $50 by registering for both Excel® Basics AND Beyond the Basics. Advance from beginner worksheets and formulas to charts, graphs and PivotCharts. Together, Excel® Basics and Beyond transform novice Excel® users into PivotTable pros. Discover the basics, plus expert power tips! Starting with the basics and moving to more advanced features, you'll learn how to turn Excel into your most powerful productivity tool. If you're only tapping into a few of the features of this powerful and versatile software, get set for a productivity explosion! You'll learn hundreds of ways to work faster, smarter and savvier with Excel! You don't have to waste hours wading through thick manuals … sitting in classes for days, even weeks … fruitlessly punching keys in trial and error learning efforts — forget all that! Our guaranteed one-day computer training gives you the most information possible in the least amount of time. Most of us don't have time in our busy workdays for extended training or on-the-job learning. Enroll in Excel Basics today, and you'll master the basics and move on to the tough stuff — away from deadlines, demands, and office pressures. So many of us work by habit — doing things the same old way we learned to do them the first time. Break free of old habits and discover the Excel power tools that are available and just waiting to be used! You'll learn the ABCs of using charts, graphs, fonts, borders, shading, and more — and produce spreadsheets that communicate better and really get attention! You'll leave the seminar with a pack of professional tips for brilliant, distinctive output every time, on every worksheet! This one-day seminar is for beginning to intermediate users. Learn how to set up Excel to meet your personal needs at work or at home, and customize its many features so that it works for you! Master an array of Excel formulas and functions that put spreadsheet power at your fingertips! Give your worksheets visual punch with exciting charts and graphs, step by step, the easy way! Make editing easy — fearlessly copy, move, delete, insert, or replace anything in your worksheet! Macros now! Even if you're a beginner, create and use simple macros that save time and sidestep mistakes! Our Excel training is just what you'll need to increase your productivity and take your current Excel skills to the next level! Save when you attend both Microsoft Excel Basics and Microsoft Excel: Beyond the Basics. Excel is one of today's most powerful and versatile business tools, but if you're not familiar with its basic functions, formulas, commands, and keystrokes, you're setting yourself up for frustration and disappointment. This Excel training gives you strong fundamentals to build on, leads you through more advanced concepts, reveals the most important new features of Excel, and sends you home with a concise, information-packed workbook that summarizes everything you've learned. *NOTE: This is not a hands-on workshop. You'll learn more in less time with our dynamic hands-off teaching approach — without wasting valuable time entering data, correcting mistakes, or waiting for other seminar attendees to catch up. Your workbook provides all the information you need to try everything you've learned later, at your own speed and convenience. Take a quick tour of Excel basics! Learn the techniques that produce visually exciting worksheets! Add impact and visual punch to your data! Gain speed, efficiency, and ease at every session! It's frustrating to know what Excel can do, but not understand the techniques to accomplish it. In one day, you will learn not only the formulas, database techniques, and macro commands that make work go faster, but you will also learn the tips and keystroke commands the pros rely on to make data more useful and worksheets easier to manipulate. One day never delivered so much practical, real-world computer skills training. You'll improve your productivity tenfold. Complicated charts and graphs that once took hours to compile will now take only minutes to set up and assemble. You'll learn when it makes sense to use a macro, how to debug a macro, and how to create and manage a PivotChart. Key code shortcuts you learn will transform multistep processes into single, simple moves. Even the advanced linking and data exchange operations you once dreaded will become easier. The skills you'll gain in this one-day advanced program make it the single best investment you can make in Excel training. Not only will you leave with a wealth of exciting new techniques and shortcuts, but you'll also receive a handy workbook guide that summarizes key tips for easy reference. It's a lot of value for your investment. An accelerated one-day workshop to make you a Microsoft Excel Pro! Improve the quality, accuracy, and usefulness of every Excel worksheet! Create visually exciting charts by adding graphics with customized drawing tools! Collect and format data the easiest way! Develop PivotCharts® and manage them in a snap! You'll learn from a business professional who speaks your language and has extensive experience using Excel in a real-world office like yours. Our hands-off teaching methods ensure you won't waste valuable time entering data, correcting mistakes, and waiting for other seminar attendees to catch up. We'll cover as much material as possible together and let you practice on your own back at work.